We started this blog series on training young athletes because parents often wonder what the benefits are to training kids at Core Blend. In today’s post, I’m going to address lifelong fitness habits, and instilling a love for exercise at a young age. There is a Core Blend client who’s a college football player, and I’ve worked with him since he was in high school. A few weeks ago, he finished up his summer prep with me and started back at school. We talked for a while about expectations for the season, weightlifting goals, my complete dominion over him in Mario Kart: normal gym stuff. As we were walking out the door, the conversation abruptly shifted to post-college plans. He was excited about being able to do a different style of training once football is done. He looks forward to exercise, and is excited to try new things and continue to improve his fitness level. That’s a fundamental goal for everyone I work with: successful lifelong fitness. People that are really successful with exercise find their niche and enjoy it. This may seem like a foreign concept to you if you don’t enjoy exercising, but it’s true nonetheless. If you associate exercise with being miserable then it’s not going to go well for you. Maybe you’ll be able to get focused and do it for a week, a month, six months, a year, but it won’t last. That girl you hate that you always see jogging past your house enjoys jogging. That guy you know that is always talking about the gym talks about it because he loves it. They look forward to that part of the day. I might do a post about you in the future, but today I’m going to focus on your kids. I would like them to enjoy exercise and associate positive memories with it. Your child will probably not play sports in college (some do obviously, but it’s not the norm). Your child will probably not be a professional athlete (fewer do, rare opportunity). As such, around 18-22 years old they’ll no longer have a coach telling them to exercise 5 days a week. At that point, they’ll be in the position you are now, needing to take the initiative and put time and effort into fitness, even though no one is forcing them to do it. That’s where I come in. Workouts at Core Blend are fun. Kids look forward to coming back every week. The workouts aren’t easy; if it was easy it wouldn’t inspire change within them. At Core Blend, I create a fun atmosphere where younger kids get in better shape and enjoy doing so. We show them how fun it can be and get them to push themselves. We don’t have contracts at Core Blend. These kids have a choice to make every month and choose to come exercise. Parents often tell me that they never have to force their kids into the car to come train with us, that they’re always ready to come; there’s really no higher praise than that. That’ll stay with them for life. They won’t associate going to the gym or exercising with someone yelling at them or being bored. To them, exercise is fun and something that they willingly hop into the car to do. Your kids are not that far away from being on their own for exercise, and I want them to grow up and be that girl who runs by your house, and that guy who talks about his gym. I want them to grow up to be adults that exercise for health and value lifelong fitness, and there’s no better time than now to start that habit. Catch up on Part 1 of this series, Speed Training. This is a question I get a lot and typically when I answer it – I mean really answer it – people have a tendency to zone out a little bit. This is an area where I can really nerd out and bore people, so from now on I’ll just send people to this blog series to get the answer. The short answer is: As soon as you feel comfortable. There are a number of benefits to training at a younger age and there are ways we can improve your child’s fitness and athleticism that are available at a younger age that we don’t have access to later. My undergrad degree was in Physical Health Education where I learned about the developing body and know how to train your child safely at any point in their development. I will have my future children doing exercise at a young age, because I know how to keep it developmentally appropriate. The long/nerdy answer: Make sure you’re comfortable because I’m about to go deep on why your child ABSOLUTELY should be training at Core Blend, from a young age. 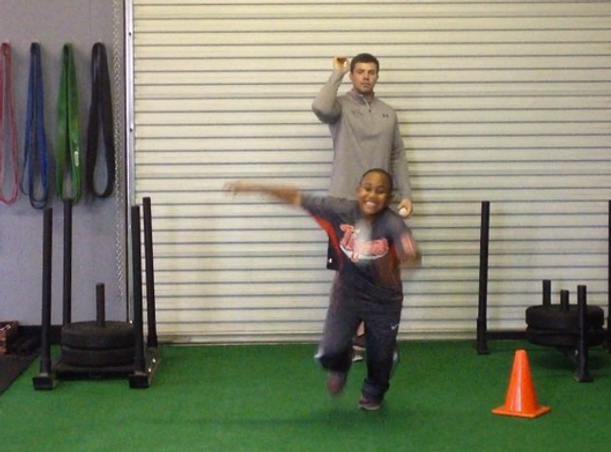 Part 1 of this series is Speed Training for Young Athletes. Speed training is more effective the younger a child starts. Speed is increased in two ways, increasing stride length and stride frequency. We can affect stride length at any age by making an athlete stronger pound for pound. Stride frequency however is more complicated. Stride frequency is greatly influenced by the activation of the Central Nervous System, a system within the body controlled by the brain. Due to what we know about the plasticity of the brain, there are a number of training techniques we can employ while the brain is still developing that we can’t employ later in brain development. There is a window in an athlete’s development where overspeed training can be used to “teach” an athlete’s CNS to move them faster. Once the brain is done developing though, this is almost impossible. This is time we can’t get back by working hard later. If you give me a kid at 16 years old, it’s about too late to do much of that with them. I won’t go into everything I do with young kids to make them fast for life here, but it’s important that you understand that it’s only possible to do some of these things at a young age. if your child plans on playing a sport where speed is important, then the younger you can get them to me the better. It’ll give us more time to work with all of the tools at my disposal instead of waiting until later in their life where I’m a little hamstrung. Here’s the next post in our series, Training Young Athletes: Lifelong Fitness.